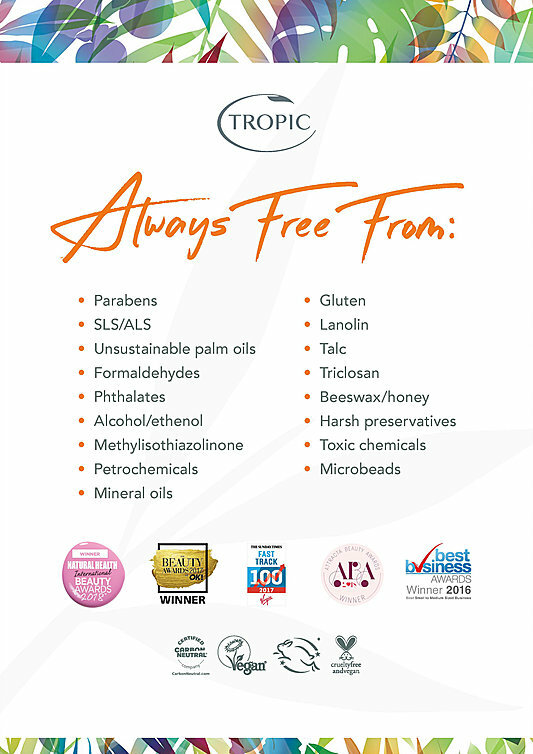 Tropic Skincare is an multi award-winning, vegan and cruelty-free beauty brand whose mission is to create products that are truly good for you. They believe plants that flourish in challenging tropical climates are the most nutritious and beneficial for the skin. All products are made using sustainably sourced, premium, natural ingredients and are freshly made every dayin Tropic's Surrey Beauty Kitchen. Shop using the button below for items delivered direct to your door! Tropic began life with a homemade body scrub sold at a stall at London's Greenwich Market when founder Susie Ma was just 15 years old. The range now includes over 100 products and has won over 70 awards to date. The Tropic Collection brings your skincare essentials together, plus an added boost of super vitamins, to create the perfect daily routine for your skin. Suitable for all skin types, even the most sensitive. A - The Soothing cleanser has a luxurious blend of uplifting eucalyptus, golden jojoba and avocado oils, this refreshing cream cleanser effortlessly melts away makeup and impurities to leave your skin feeling unbelievably soft and clean. B - Vitamin Toner Pore Refining mist is bursting with organic rose water, aloe vera and cucumber juices, this instant skin refresher is infused with vitamins and amino acids that help to balance pH and reduce pore size. The ABC skin routine will leave your skin feeling renewed and refreshed!